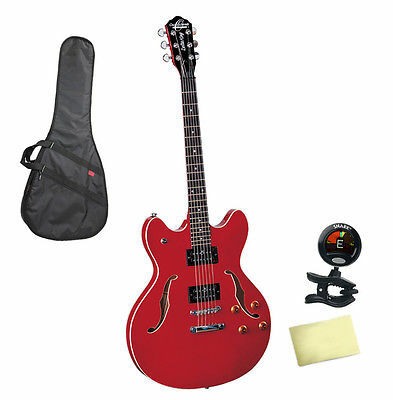 Save With This Bundle: Package Includes: Oscar Schmidt OE30CH Cherry Vintage Style Single Cutaway Guitar, Kaces Razor KXA3 Xpress Acoustic/Dreadnought Guitar Bag, Snark SN-5 Tuner for Guitar, Bass and Violin and a Custom Designed Polishing Cloth. Our Razor Xpress Series acoustic guitar bag features a new, sleek, and economical design. 1 year limited warranty. Priced just right for any budget, the Snark SN-5 tuner helps you get the perfect tuning fast and easy – just what you need to get back to playing. The full-color display makes it easy to read so there’s no guesswork involved. Snark tuning bliss is this.